The Oakland Raiders have placed running back Marshawn Lynch on injured reserve, the NFL team announced on Monday. 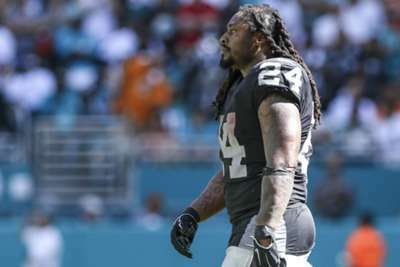 Lynch suffered a groin injury in the Raiders' 27-3 week-six loss to the Seattle Seahawks in London. The 32-year-old and Super Bowl champion rushed for 45 yards on 13 carries in that game. According to reports, the earliest Lynch can return is against the Denver Broncos in week 16. We have placed Marshawn Lynch on IR. Lynch – a five-time Pro Bowler – has averaged 4.2 yards per carry and tallied three touchdowns in six games this season. Doug Martin and Jalen Richard are expected to see an increase in their workload with Lynch sidelined. The Raiders also sent wide receiver Amari Cooper to the Dallas Cowboys in exchange for a first-round pick on Monday.